On November 6, Charge d'Affaires a.i. Zhu Qin met with H.E. Daniel Fábrega, the Ambassador of Panama to the UK, at the Chinese Embassy and exchanged views with him on China-Panama relations and the first China International Import Expo (CIIE). 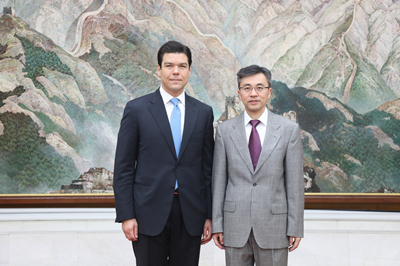 Fábrega said that the Panamanian government attaches great importance to developing friendly cooperation with China. Since China and Panama established diplomatic relations in June 2017, there have been frequent exchanges of high-level visits between the two countries, and the bilateral cooperation in various fields has been gradually expanding. At present, China is Panama’s second largest trading partner, and more and more Chinese companies are actively participating in Panama’s infrastructure development. The China and Panama Free Trade Agreement has gone through three rounds of negotiations. This week, H. E. Juan Carlos Varela, President of Panama is leading a delegation to the first CIIE in Shanghai to further deepen China-Panama economic and trade cooperation. Zhu noted that since the establishment of diplomatic relations between China and Panama, the bilateral relationship has maintained a sound momentum with great potential and broad prospects of cooperation between the two countries. In November 2017, President Varela paid a successful visit to China, which further enhanced the political mutual trust and promoted the exchanges and cooperation in various fields between the two countries. The first CIIE is a major measure of China to promote an open world economy and support economic globalization. He hoped that the two countries would take the opportunity to further strengthen their pragmatic cooperation and promote the in-depth development of China-Panama relations.